While out walking through the quaint town of St. John’s we discovered Girasole Wood Fire Cafe. I had not heard about it or looked it up. I had no idea what we were about to discover when we walked into this place. The menu had a great selection, but there was also a special on the board. Since they served both sandwiches and pizzas we thought the special was a sandwich, turns out it was a pizza. Had we known sooner we may have tried it, so be sure to ask. There were quite of few of us on this day, so we ordered 3 pizzas. 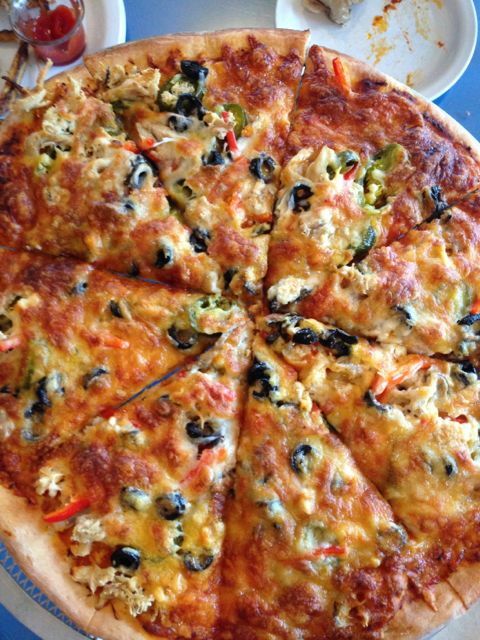 Everyone agreed the Mean Street with house-made hot chili-tomato sauce, oven roasted chicken, red bell peppers, red onions, jalapenos, & black olives, topped with our house three-cheese blend looked good, so we got a large one of those. 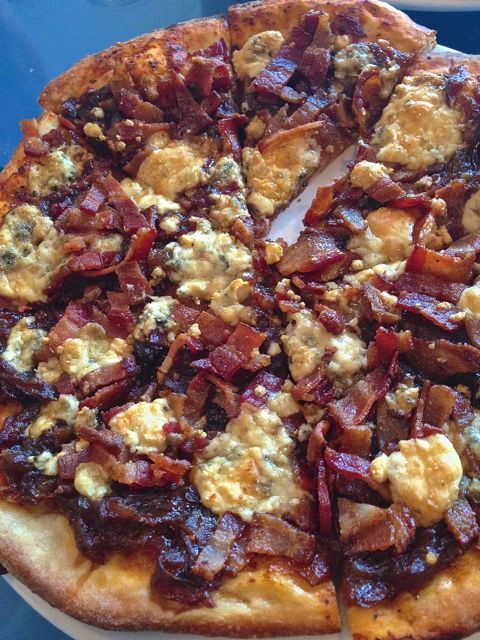 I wanted the Mimi with Caramelized onions & wood fired bacon topped with crumbled blue cheese. I really liked it, even though the blue cheese was strong, but I was alone in liking this one. Needless to say, I had leftovers. We also got the God Father with house-made tomato sauce, pork sausage, pepperoni, mushrooms, red onions & fresh mozzarella, which was also a hit. Then the dessert caught my eye. 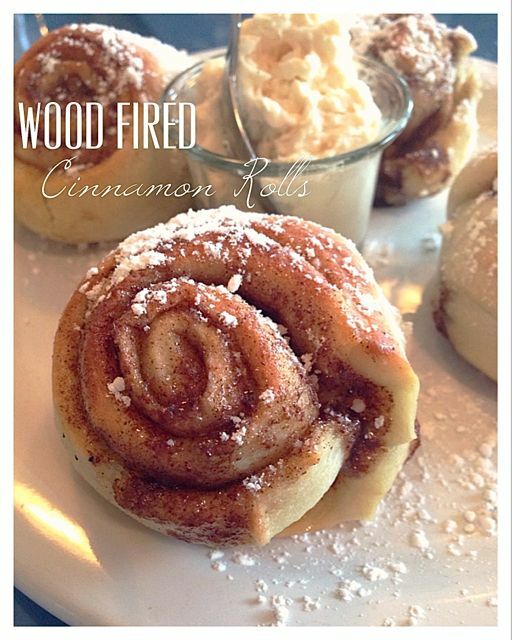 “Wood Fired Cinnamon Rolls – please allow 20 minutes”. Once we ordered all our pizzas we told our server we would be having dessert, so make sure it get started at the right time. They were on it. The pizzas were good, but let me tell you, it was the cinnamon rolls that stole the show that day for everyone in our group. Everyone loves the center of a cinnamon roll. These were so small that it was like eating a giant center. They were moist all the way through, even the outside was moist, not dry like most cinnamon rolls that are cooked alone (as opposed to stuck together in a pan). In the center of these 4 cinnamon rolls was a container of cream cheese frosting that just melted on these, hot out of the wood fired oven, cinnamon rolls. Wow!! Speechless. I am always looking for the best cinnamon roll in Portland, and I think this one easily makes the top of the list. Atmosphere at this place is simple and open. It has lots of seating and set up well for families. Pricing was around $10 for a small pizza and $17 for a large. It varies depending on toppings. They did have a few beers on tap and wine. Girasole Wood Fired Cafe is located in downtown St. Johns.